Police restraint tactics are under fresh scrutiny after a third member of the public died following the use of either a Taser stun gun or pepper spray by officers. Amnesty International said the number of fatalities over the past eight days had reaffirmed its concerns that Tasers were “potentially lethal” weapons. Initial reports suggest Philip Hulmes, 53, was hit by a Taser after refusing to leave his terraced house in Over Hulton, near Bolton on Tuesday night. It is understood that his daughter had called the police after he locked himself inside his house while in possession of a knife and began to harm himself. Greater Manchester police said when officers arrived they were threatened by the man and a decision was made to “deploy the Taser”. “Following that, it became quite obvious the man had serious stab wounds to his stomach,” a spokesman said. A postmortem was being carried out on Hulmes and the death has been referred to the Independent Police Complaints Commission. As forensic teams moved into the property on Wednesday, Kenneth Brown, who lives several doors away, said he had watched the events unfold. “We saw all the flashing lights and police and ambulance at the front,” he said. Brown said his neighbour had worked as an HGV driver but was made redundant. Most recently, he was employed by a firm which delivered parts for mechanics. As investigators began piecing together the events which led to Hulmes’s death a white police tent covered the entrance to his property on a busy main road near the M61. Christine Bellis, 61, another neighbour said Hulmes had lived alone and was a regular dog walker who was very friendly and easy to talk to. The death of Hulmes came as the IPCC continued its investigations into two other fatalities after the use of restraint techniques by police in two different forces; Cumbria and Cheshire. Dale Burns, 27, died after being subjected to shocks from a Taser gun and pepper spray when police were called to his flat in Cumbria last week and Jacob Michael, 25, died on Monday after being pepper sprayed during his arrest by 11 officers in Widnes, Cheshire. Postmortems into Burns and Michael have proved inconclusive and investigators are waiting for the results of toxicology tests for more information. 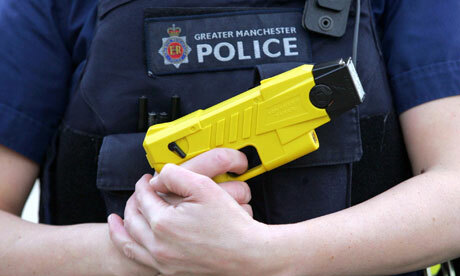 Simon Chesterman, the Association of Chief Police Officers lead officer on Tasers, told the Guardian their use was carefully scrutinised by the scientific and medical community, and in cases where there were fatalities, by the IPCC. But Helen Shaw, co-director of Inquest, the charity that advises the family of those killed in contentious circumstances, said the police did not seem to have learned lessons from a pattern of cases where inquest juries had found “overwhelming evidence of unlawful and excessive use of force or gross neglect.